Anyone going to the 4 Wheel Parts grand opening in Glen Burnie tomorrow? 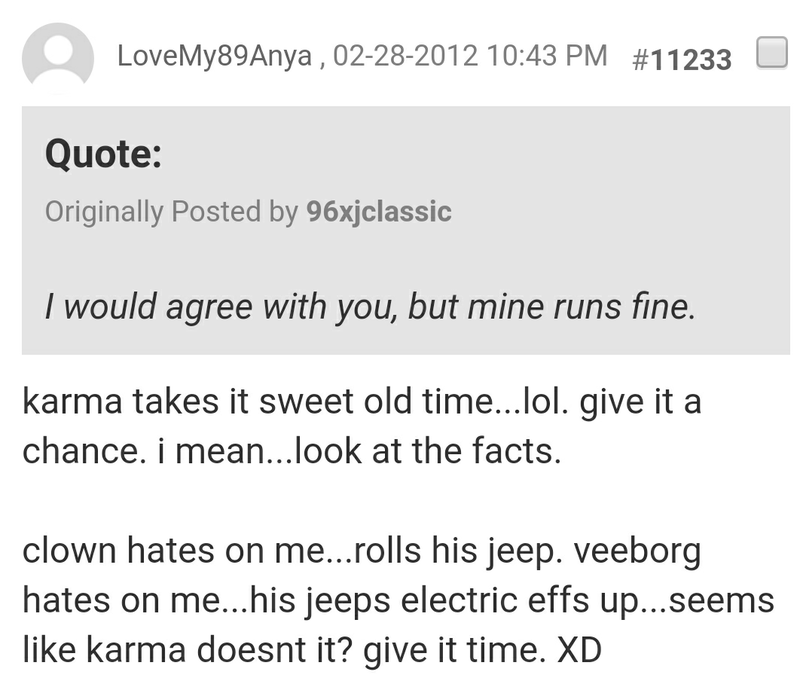 Remember the guy that was asking for advice on how to install a litter box in an XJ for his cat because he and his Juggalette girlfriend were living out of his Jeep? I went out of my way to pick him up for a junkyard trip one day and gave him about $150 to buy parts because he was out of work. Then I took him to the grocery store on the way back to his place, and I bought him $75 worth of groceries. Within a few weeks, he had managed to severely **** off everyone here, and then he sent me a Facebook message saying I deserved to die in my rollover. Yeah, that's really screwed up Tim. It's because you look funny. Do all that, and then he says that is just rude. People like that will get their just rewards in time. I don't recall ever being anything but civil to him.